Reduced sugar hot chocolate drink. Store in a dry place. Protect from heat., Best before: see cap. Portion size is 3 heaped teaspoons (18 g) & 200 ml semi-skimmed milk. 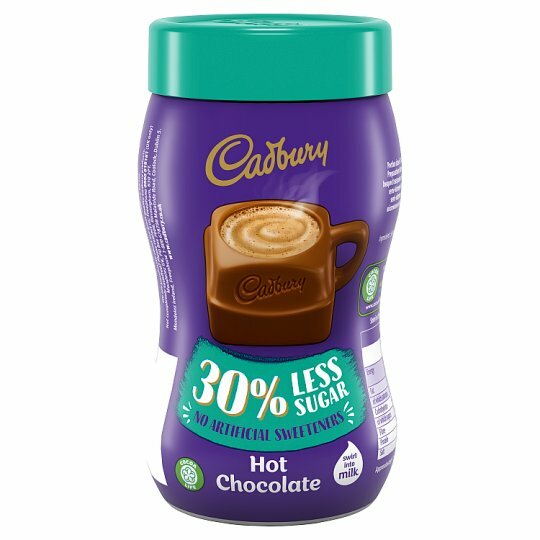 Preparation Instructions (with 200 ml semi-skimmed milk): Swirl three heaped teaspoons of Cadbury Reduced Sugar Hot Chocolate into a mug of hot semi-skimmed milk and stir. Alternatively, mix the powder with cold semi-skimmed milk in a microwaveable mug and heat in a 800 W microwave on high for 1 min, stir then microwave for a further 30 sec. Stir before drinking.